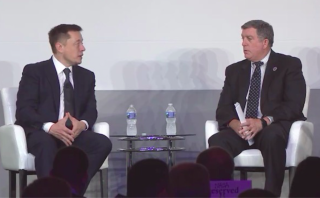 Elon Musk (left) talks to NASA International Space Station (ISS) program manager Kirk Shireman on July 19, 2017, at the ISS Research and Development conference in Washington, D.C.
Musk has been relatively quiet about the ITS since then, but he said he plans to give an update about the architecture at the next IAC conference, which will be held this September in Adelaide, Australia. And he teased an ITS tweak that SpaceX has been working on. Downsizing the ITS spaceship a bit — the originally unveiled version would carry at least 100 people — and using it for some profit-generating "Earth-orbit activity" could help make Mars colonization economically feasible, Musk said at the ISSR&D conference today. "That's one of the key elements in the new architecture," Musk said. "It's similar to what was [unveiled] at IAC, but it's a little bit smaller — still big. I think this one's got a shot at being real on the economic front. You know, that's the trick." Musk also said today that another one of his ventures, The Boring Company, could aid in Mars colonization as well. The Boring Company's main goal is to construct tunnel networks beneath (and, eventually, between) traffic-choked cities such as Los Angeles, enabling speedier travel. But advanced tunneling technology will also be in high demand on Mars, Musk said, citing the likely need to mine large amounts of ice and other natural resources. And Red Planet colonists may want to live underground, at least part of the time, to shield themselves from the relatively high radiation fluxes encountered on the Martian surface, he added. "You can build a tremendous amount underground with the right boring technology on Mars, so I do think there's some overlap in that technology-development arena," Musk said. But Earth-optimized tunneling machines won't do the job on Mars, he stressed. "The Earth ones are really heavy. Like, really heavy," Musk said. "You're not worried about weight for an Earth tunneling machine; actually, you want one that's nice and heavy. But a Mars one, you'd have to redesign it to be superlight — that's a tricky one — and then just take into account the different conditions on Mars and everything else."